Glaucoma is an eye disease that slowly and painlessly steals away your sight. Glaucoma is often called the silent thief of sight because it has no symptoms. However, it is the second leading cause of blindness in the United States, and half of people with glaucoma don’t know they have the disease and aren’t aware of their risk of potentially severe vision loss. If you have any of these risk factors, you should get regular eye examinations to check for glaucoma. Schedule an appointment today! 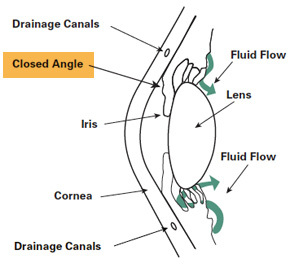 In primary open-angle glaucoma, the drainage angle formed by the cornea and the iris remains open, but the microscopic drainage channels in the angle (called the trabecular meshwork) are partially blocked, causing the aqueous humor to drain out of the eye too slowly. This leads to fluid backup and a gradual increase of pressure within the eye. Damage to the optic nerve is painless and so slow that a large portion of a patient’s vision can be lost before the patient is even aware of a problem. Closed-angle glaucoma occurs when the iris bulges forward to narrow or block the drainage angle formed by the cornea and the iris. As a result, aqueous fluid can no longer reach the trabecular meshwork, and eye pressure increases abruptly. Closed-angle glaucoma generally occurs suddenly, but it can also occur gradually. 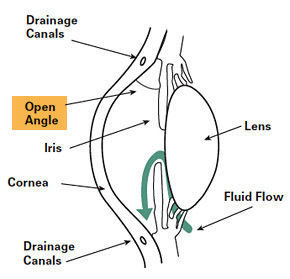 Many people who develop closed-angle glaucoma have an abnormally narrow drainage angle to begin with. In some cases, this narrow angle never causes any problems and can go undetected for life. The most common types of glaucoma — primary open-angle glaucoma and closed-angle glaucoma — have completely different symptoms. Gradual loss of peripheral vision, usually in both eyes. Tunnel vision in the advanced stages. There usually are no signs or symptoms of this condition. Severe eye pain, which can cause nausea and vomiting. A number of medications are currently in use to treat glaucoma. 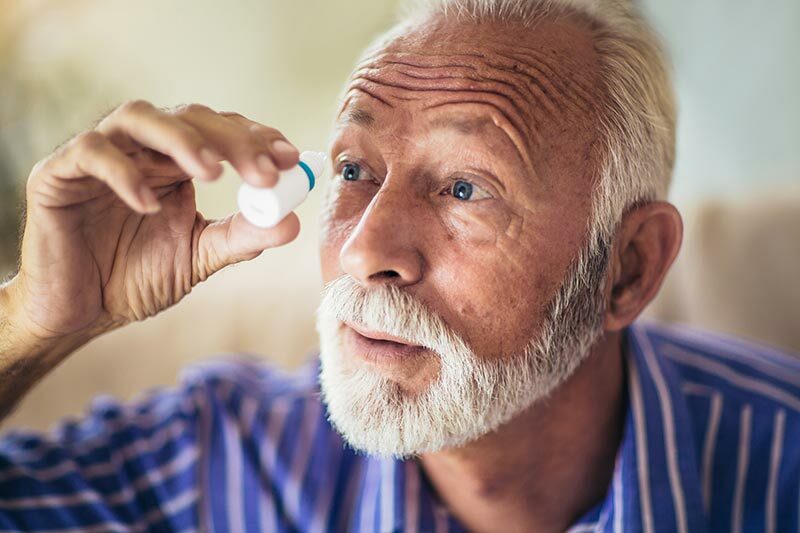 Your Capitol Eye Care doctor may prescribe a combination of medications or change your prescription over time to reduce side effects or provide a more effective treatment. Typically, medications are used to reduce elevated intraocular pressure and prevent ongoing damage to the optic nerve. 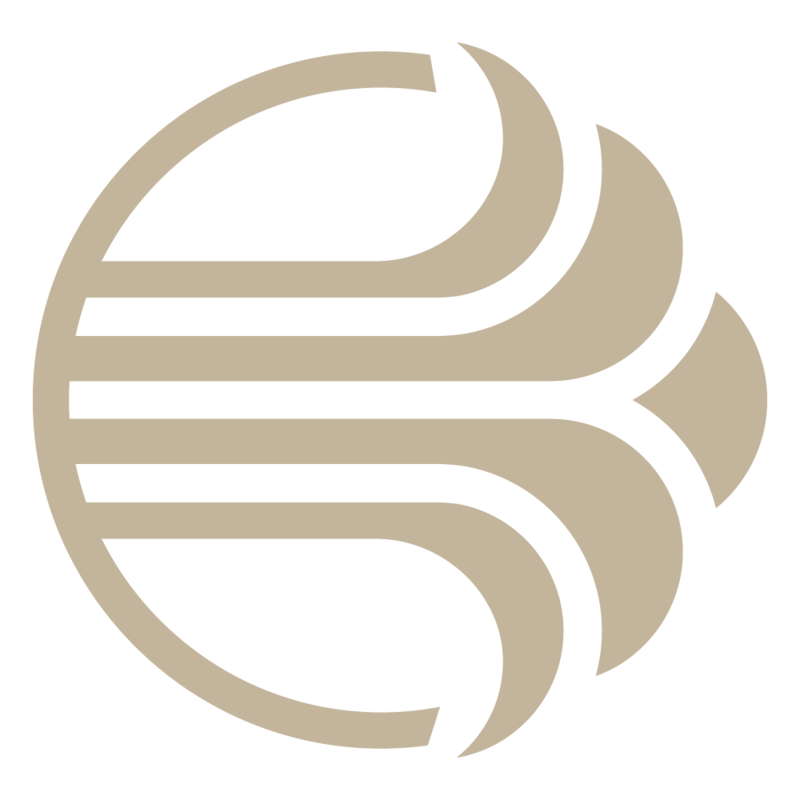 SLT uses a laser to treat the drain directly to help increase the outflow of fluid. It treats specific cells selectively, leaving the trabecular meshwork intact. For this reason, SLT may be safely repeated. It is not painful, and often can be an alternative to eye drops in early open-angle glaucoma. 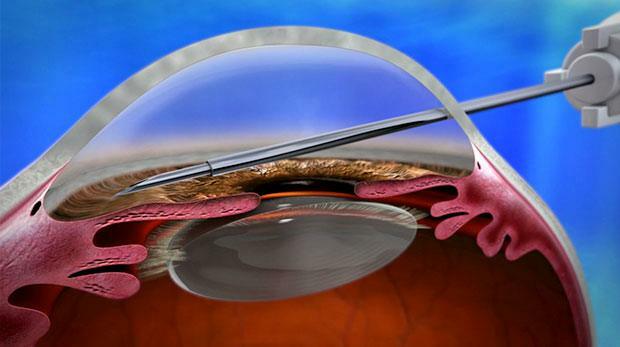 Among the most exciting and impactful advances in the field of ophthalmology in the last decade has been the introduction of a number of new surgical procedures designed to lower the intraocular pressure, often performed in conjunction with cataract surgery. 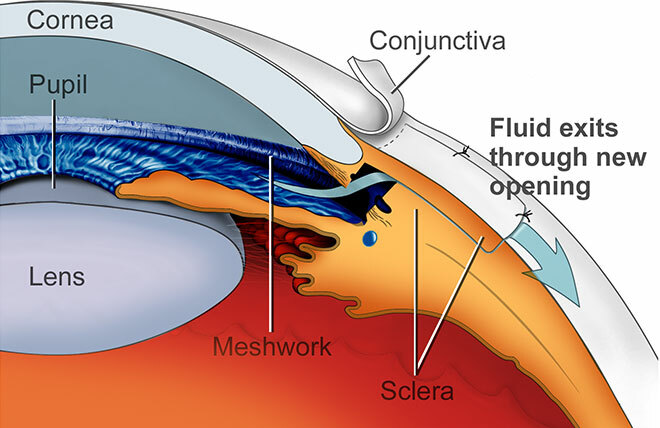 These procedures, collectively known as minimally invasive glaucoma surgery, all work to take advantage of the eye’s native fluid outflow tract, with the objective being to make it easier for the fluid inside the eye to get into and through that outflow tract. A few examples of MIGS surgery are the ISTENT Inject and canaloplasty with goniotomy. The ISTENT Inject is the world’s smallest implantable device. Made of titanium, the ISTENT Inject is a tiny pipe that simply allows fluid in the eye to bypass the trabecular meshwork and get into the collector channels, thereby reducing the intraocular fluid pressure. Canaloplasty with goniotomy is a procedure wherein the ophthalmic surgeon places a tiny cannula into Schlemm’s canal, dilating the canal and collector channels. Then the surgeon gently incises the trabecular meshwork, thus allowing the intraocular fluid to reach those collector channels more easily. The advantages of MIGS surgery over the more traditional trabeculectomy surgery are much faster healing, much faster return to normal activity, and less potential for scar formation. During a trabeculectomy (or filtration surgery), a new drainage opening is created to bypass the clogged drainage channels of the trabecular meshwork. The opening is partially covered with a flap of tissue from the sclera (the white part of the eye) and the conjunctiva (the clear thin covering over the sclera). This new opening allows fluid to drain out of the eye under the conjunctiva and form a little blister, or bubble, called a bleb. The bleb is located just under the upper eyelid, where it is not visible. 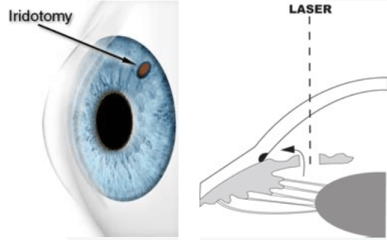 Trabeculectomy surgery has been around for many years and in some cases still today is an excellent means of providing for a major drop in the intraocular fluid pressure. Closed-angle glaucoma occurs when the iris bulges forward to narrow or block the drainage angle formed by the cornea and the iris. As a result, aqueous fluid can no longer reach the trabecular meshwork at the angle. 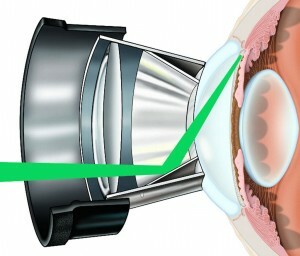 LPI creates a small hole in the iris, allowing it to fall away from the drainage angle and unblock the drain.